How Many Prongs in Mueller’s Investigation of Trump-Russia? Dinner forks have 4 prongs. How many prongs does Robert Mueller’s investigation of Trump-Russia have? The following consists of analysis of what is already publicly known along with some informed speculation. To be clear, I claim no non-public sources of information. — It is self-contained. Any investigations, indictments, or convictions are intrinsic to what’s in that prong. — It matters. It either involves significant wrongdoing resulting in indictments and convictions, and/or it provides important motivation or otherwise connects to another prong that eventually results in other indictments and convictions. — The burglary at the Watergate office complex committed by Nixon’s operatives, certainly with Nixon’s knowledge and perhaps at his directive. — The cover-up of that crime committed by several members of Nixon’s White House, starting with Nixon himself. While there were other prongs (e.g. the break-in to Daniel Ellsberg’s psychiatrist’s office), the above 2 prongs were the dominant sources of indictments, convictions, and ultimately the downfall and resignation of Richard Nixon. Often, it’s hard to fully understand what the main prongs are of an investigation while it’s playing out. Instead, information comes out in strands. Over time, the strands start to tie together, making it clearer which prongs are separate and which seemingly separate strands eventually tie into the same prong. This is where we are today with Mueller’s investigation of Trump-Russia. How many strands are there to the Trump-Russia investigation? Russian Hacking into politically relevant troves of documents (DNC, Hillary Clinton’s campaign manager), the release of those documents, and other types of interference in the 2016 Presidential Election. Trump Campaign Involvement with Russian Hacking: Did the Trump Campaign know about the Russian hacking before it was public? And, if so, did they do anything to aid, abet, and/or directly benefit from Russia’s efforts? Illicit Trump Financial Ties to Russia: Does Donald Trump and/or do his companies have extensive financial ties to Russia that (a) involve him in money laundering or other financial impropriety, and/or (b) make him beholden to Russia or otherwise compromise his ability to faithfully serve as U.S. President? Trump Blackmailed by Russia in Non-Financial Ways: Does Russia posses material (“Kompromat”) that they are using to blackmail him directly, and/or that Trump is worried they will use to discredit, embarrass, or otherwise damage him? Cover-up: Has Donald Trump and/or other senior members of his family and/or administration engaged in obstruction of justice or other illegal cover-up activities associated with any of the above areas? The 5 strands known to be under investigation, and the 4 other topics very likely under investigation surely don’t represent 9 separate “prongs” of the investigation. But whether and how these strands are intertwined with each other remains murky, at least based on information that’s public today. Nonetheless it’s useful to try to see how these separate strands could tie together into fundamental prongs. This is helpful for many reasons, including (a) helping the public understand the broader narrative of what’s being investigated and where the plot is likely going, and (b) guiding investigative journalists and others as they look under rocks to help move the investigation forward. In June the Washington Post’s Callum Borchers grouped the investigation into 3 prongs: Russian Meddling & Trump Campaign Collusion, Obstruction of Justice (i.e. a Cover Up), and Financial Crimes. 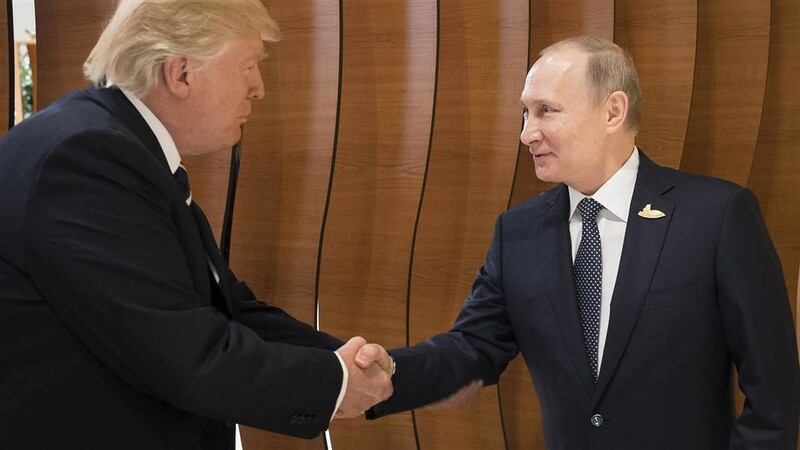 President Trump Betraying his Oath of Office by Exhibiting Fealty to Russia over Fealty to the U.S. The last 2 are important additional prongs through which to view the Mueller investigation. Regarding financial crimes, it appears that there certainly have been financial crimes committed by Manafort, Price, and perhaps Flynn that do not directly implicate President Trump or the campaign. It’s important and appropriate that Mueller pursue these vigorously. The question that remains is whether there were also financial crimes that implicate the Trump campaign or Presidency, and/or Trump himself. There are outlines of places to look for these links and certainly many credible rumors and pieces of evidence that need to be investigated. But at this point, nothing public has yet come out that points to an indictable crime. Regarding Trump potentially betraying his Oath of Office, it’s important to view that as a potential crime/charge separate from financial crimes. For instance, if Trump is actually being blackmailed by Russian Kompromat, he may be violating his oath for reasons other than direct financial gain. [Note that while some may call this Treason, I am avoiding that term because it has a very specific meaning in our constitution that’s narrower than how the term is commonly used.] The most powerful public evidence pointing to this crime is Trump’s often lavish praise of Putin coupled with Trump’s bizarrely consistent refusal to criticize Putin for anything. It’s too soon to say where Mueller’s investigation will lead and where it will end up. But it’s already clear even at this early date that the likely outcome will be the revelation of a series of crimes that surpass Watergate in seriousness and risk to the fundamental integrity of our country and system of government. The 3 indictments that have happened so far are clearly just the tip of the iceberg — expect dozens more to come in the weeks and months ahead. And, if President Trump is directly linked to any one of the 4 prongs involving his presidency, the only possible just outcome will be his removal from office. We must all stay lucid and vigilant to ensure that the investigation moves forward apace and without interference.